Do you have an old 1943 penny? Are you looking for the 1943 penny value? Maybe you’ve got a 1943 steel penny, or maybe even the valuable, rare 1943 bronze penny. 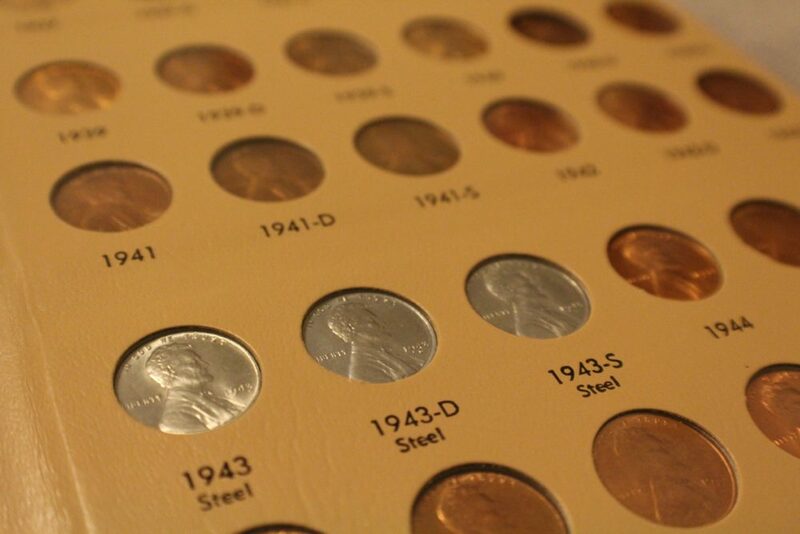 Want to know what your 1943 pennies are worth? You’ll find the answer in this post. 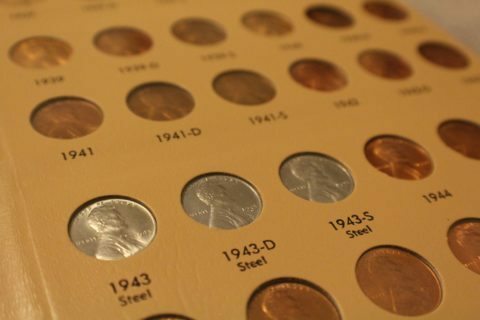 Here we will cover the 1943 steel pennies, tell you how to know if you’ve got the rare 1943 copper penny, and help you find out how much your 1943 penny is worth! The 1943 penny is unusual among United States one-cent coins. It’s the only regular-issue United States one-cent coin to be minted from steel (the 1944 steel penny off-metal error is not considered a regular issue), and it’s therefore one of the most popular coins people collect. Why was the penny made from steel? To save copper for World War II ammunitions. The war years of the 1940s was a time of rations. Everything from rubber to sugar was rationed because America needed to send these items to its troops fighting overseas. Copper, like so many other common materials, was one of those items. Officials with the United States Mint had to find a way to replace the copper in the one-cent coin with a low-cost material. Plastic was among the many materials the Mint considered before determining zinc-coated steel to be the choice among its cost-effective options. The steel cents were a creative solution, but they weren’t without their problems. Many people confused the silver-colored pennies for dimes. Magnets in vending machines designed to weed out counterfeit coins filtered out authentic 1943 steel wheat pennies. The steel inside the coin was prone to rusting after exposure to moisture. These and other issues plagued the 1943 steel cents. After just 1 year, the Mint reverted back to copper — using the metal from spent copper shell casings to strike Lincoln pennies from 1944 through 1946. Here’s a really easy test to see if you’ve got the common 1943 steel penny or a rare copper 1943 penny. If your 1943 penny sticks to the magnet, it is a common steel cent and NOT worth the big bucks. If your 1943 penny does NOT stick to the magnet, it may be a rare 1943 copper penny. Further authentication is required to see if it’s a legitimate 1943 copper cent. What about those 1943 copper pennies? It is believed they were accidentally made from a few remaining blank copper planchets that were left in hoppers at the coin presses. These copper blanks were unintentionally fed into the coining equipment along with steel planchets, thus resulting in the creation of perhaps a couple dozen 1943 copper cents. What Are 1943 Pennies Worth? What’s the difference in values between a 1943 steel penny and a 1943 copper penny? All 1943 pennies are worth more than their face value, but how much more is the question a lot of folks want to know the answer to. *Values are for problem-free coins (no cleanings, holes, porosity, etc.) in circulated condition unless otherwise specified. Uncirculated 1943 pennies are worth significantly more than the prices listed here. What Else Happened When Your 1943 Penny Was Made? Franklin Delano Roosevelt and Winston Churchill held the Casablanca Conference to discuss World War II plans in an international forum. The Pentagon in Washington, D.C. was completed, becoming the nerve center for World War II and other international conflicts that later unfolded. President Roosevelt froze prices and incomes to help prevent inflation in the wartime economy. Rodgers & Hammerstein’s Oklahoma! opened on Broadway to the delight of audiences who enjoy the top-tapping American folk dance show. “Coming In On A Wing And A Prayer” was one of dozens of popular World War II songs. What’s The Value Of Wheat Pennies?